3LD (Kevin Cunningham, Artistic Director) is thrilled to announce that the 3D film version of the groundbreaking international phenomenonCHARLIE VICTOR ROMEO is an official selection of the 2013 Sundance Film Festival, where it will make its World Premiere. The film is in the Sundance Film Festival’s New Frontier program, which explores “the convergence of film, art, new media technology and storytelling.” One of only 170 selections chosen from over 12,000 entries, CHARLIE VICTOR ROMEO is the only 3D film in this year’s festival. 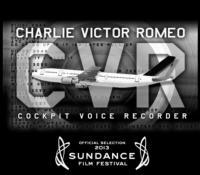 Having been described as “the most frightening show I have ever seen”, CHARLIE VICTOR ROMEO is an award-winning performance documentary derived entirely from the “Black Box” transcripts of six major real-life airline emergencies. Allowing the audience into the tension-filled cockpits of actual flights in distress, CVR is a fascinating portrait of the psychology of crisis and a testament to the ability to live to the last second. Using stereoscopic 3D camera technology, these harrowing stories were translated onto the big screen without sacrificing the intimate communication of the intensity and emotion of these emergencies. The audience has the best seats in the house. CHARLIE VICTOR ROMEO is Executive Produced by Kevin Cunningham, Patrick Daniels and 3 Legged Dog, and produced by Caterina Bartha, Robert Berger, Patrick Daniels, and Collective: Unconscious. The film is directed by Robert Berger and Karlyn Michelson with a screenplay by Robert Berger, Patrick Daniels, and Irving Gregory. The cast features Robert Berger, Patrick Daniels, Noel Dinneen, Irving Gregory, Debbie Troche, Nora Woolley, and Sam Zuckerman. The stage production was created in 1999 by Robert Berger, Patrick Daniels and Irving Gregory, and premiered at Collective: Unconscious in NYC. It won critical acclaim and was immediately embraced by the aviation community. CVR won numerous awards including two Drama Desk Awards for Outstanding Unique Theatrical Experience and Outstanding Sound Design, and made Time Magazine’s Best Theater Top Ten Plays in 2004. Following the premiere through 2008, CVR toured nationally and internationally. It recently returned to NY for an encore run at 3LD this past October. 3LD/3D+ is a new distribution structure for experimental artwork created by NYC-based performing arts and new media organization 3 Legged Dog. This structure combines a domestic and international touring circuit with the broad reach of secondary markets through filmed high definition (HD) and three-dimensional (3D) video productions. Through partnerships with Tendu TV, NHK Cosmedia America and others, 3LD/3D+ productions are distributed through an international network of digital & 3D movie theaters, cable and satellite channels, video-on-demand services and digital platforms. Collective: Unconscious fosters an inclusive, creative community based in NYC. Founded in 1995 by a group of multi-disciplined artists, Collective: Unconscious was conceived both to perform unique experimental theater and to administer a space that would serve as a community resource and laboratory in the performing arts. They support the emerging arts community of New York City in several practical ways: (1) by providing an administrative and technical resource center for artistic development, management and action; (2) by helping artists to promote their work; and (3) by providing fiscal sponsorship for selected projects.